You and your friends have to decided last minute to celebrate Independence Day at your house. There is just one problem. You were not planning on having guests, and all the hot dog and hamburger buns are sold out at the grocery store. No need to fret; here are a few quick July 4th ideas to get the party rolling. Flowers: Even if you have to get fake sunflowers, do so. Sunflowers are a staple for summer tablescapes and a go to for table decor. Plates: Use blue paper plates. After all, you will want to watch the fireworks instead of doing dishes the entire evening. Napkins: Bandannas are soft, remind you of a farm (unless you are from a not so nice neighborhood), and they go with the blue plates. Beverage: Pour Country Time Lemonade in some mason jars, and it will look like you put thought into this shin dig. Main Course: Corn Dogs are fantastic when you are in a rush. All the ingredients are there, and all you have to do is bake them and provide the mustard. Side Dish: Grab a bag or two of coleslaw while you are at the grocery store. Add a heaping tablespoon of mayonnaise, a dash of pepper, and stir. The coleslaw should be moist, but not wet. Dessert: Since you don't have time to make an amazing cake with strawberries and blue berries, you can have strawberry ice cream on a cone. It is festive and nostalgic. Have a safe and wonderful July 4th! God Bless America! 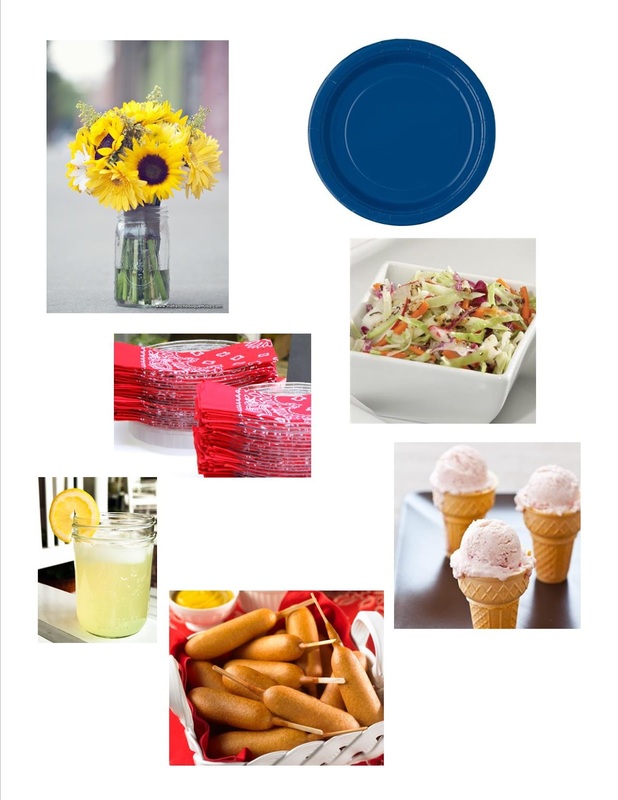 Photo Sources: Sunflowers, Lemonade, Plates, Bandannas, Ice Cream, Corn Dogs, & Coleslaw.